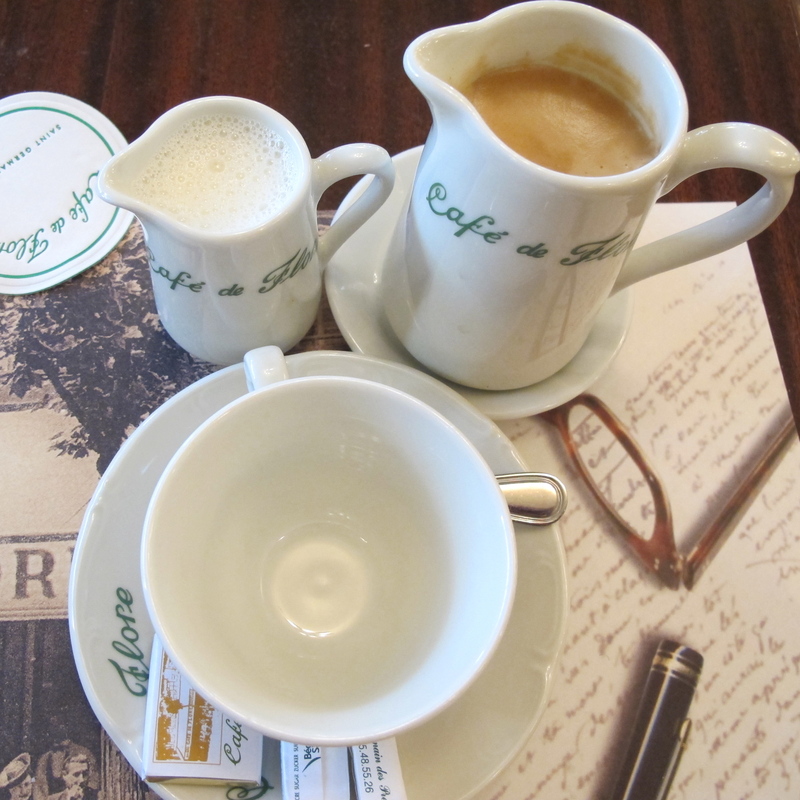 The Café de Flore has a duality about it: on one hand it’s the quintessence of a Parisian café, and on the other it’s a bit of cliché beloved by tourists. The Flore divides opinion. I like it and often return to it when I am in Paris and I did so again, for a late lunch, on my most recent visit to the City of Light. The café is on the Bouelvard St Germain, at the junction with the Rue St Benoit, in the swish sixth arrondissement, not far from: the banks of the Seine, a ton of interesting shops, and Notre Dame itself. 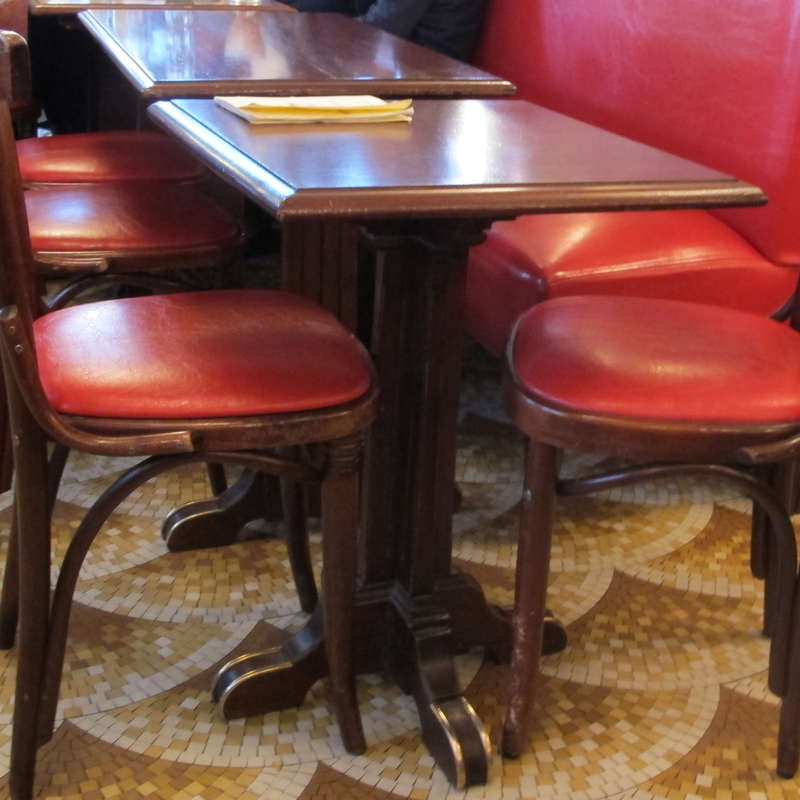 The Flore has: tables and chairs on the pavement; a covered terrace; a ground floor room filled with dark wooden tables, and chairs and banquettes covered in red leather; and a first floor room decorated much as the ground floor except in neutral colours. The waiters, who are all male, look as if the came straight from central casting: they hold their trays aloft as they weave their way between the tables, and in their black and white rig-outs, they look, for all the world, like penguins on roller skate as they glide around. They seemed to have drunk in Sartre’s dictum that – ‘hell is other people’: they are aloof and unsmiling. However they are polite and utterly professional and the food arrives pretty pronto, exactly as you ordered, which considering the café is an uber busy tower of babel-esque spot, is semi-miracalous. I normally, when I am there for lunch, have the Flore version of Welsh Rarebit, which I love and recommend. However on my recent visit, in a bid to break my creature-of-habit ways, I ordered a Caesar salad. It was ok-ish, but definitely not the salad Caesar Cardini had in mind when he invented the dish, I suspect the slices of cheese on top and some extraneous ingredients may have had him spinning, like a gyroscope, in his grave. 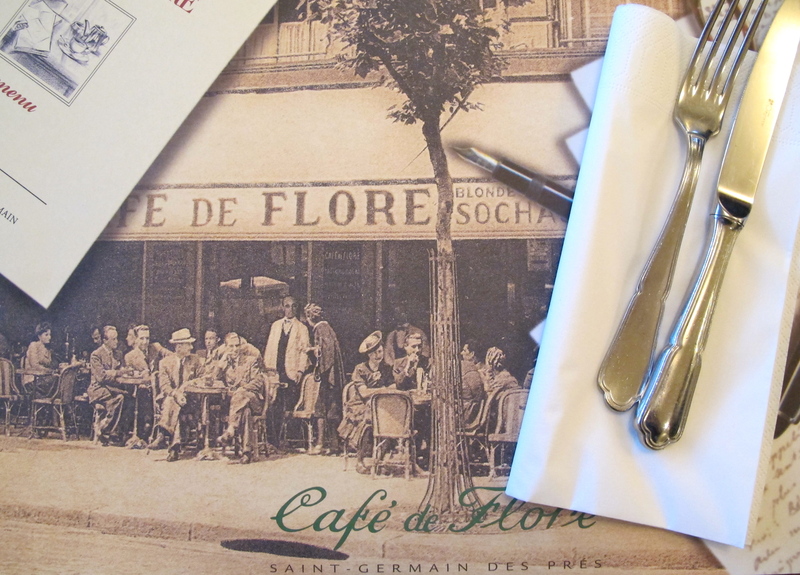 The food the Flore serves is far from being the best, or the best value in Paris but nonetheless, I think, a visit to the Flore at some time on a visit to Paris is almost obligatory, if not for a meal at least to sample a coffee or hot chocolate while watching the world go by. I will visit next time I am in Paris, thanks for the tip. Hope you like the Flore and I also hope you get to Paris soon. Sounds like a lovely place for an afternoon bite to eat! Alas, if only I was close enough to visit and try it out 😉 I’m making a mental checklist of places that you’ve mentioned for whenever my next trip is! 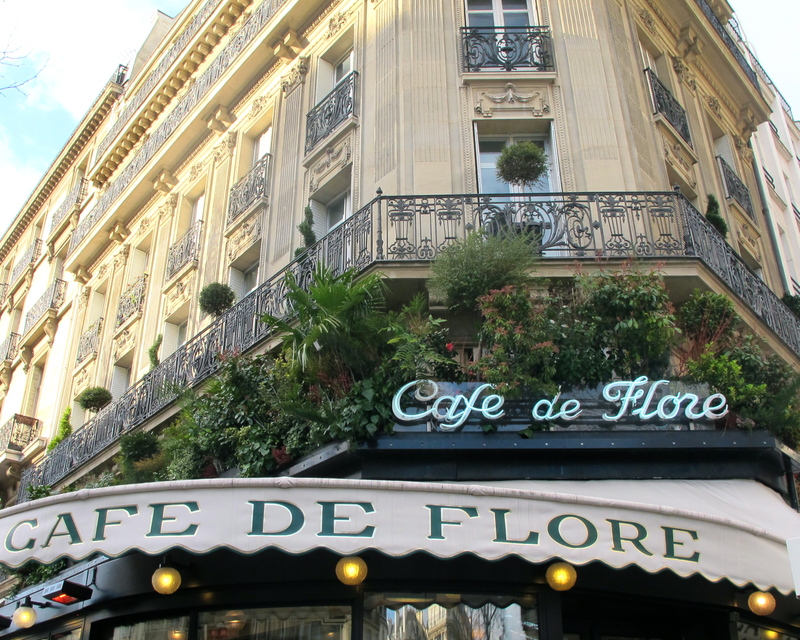 Nothing more wonderful than sipping coffee, tea or even wine and watching the world go by in Paris and Cafe de Flore is a landmark. I too am a creature of habit when it comes to food I order at restaurants and unfortunately I am often disappointed when I steer away from the norm. I am glad someone else is a creature of habit when it comes to choosing from a menu. That makes me feel better as I ofter beat myself up, metaphorical speaking, for sticking to the same choices. Every time I have passed this cafe I avoid it. I don’t want to be considered a tourist so I never go. This post has changed my mind. 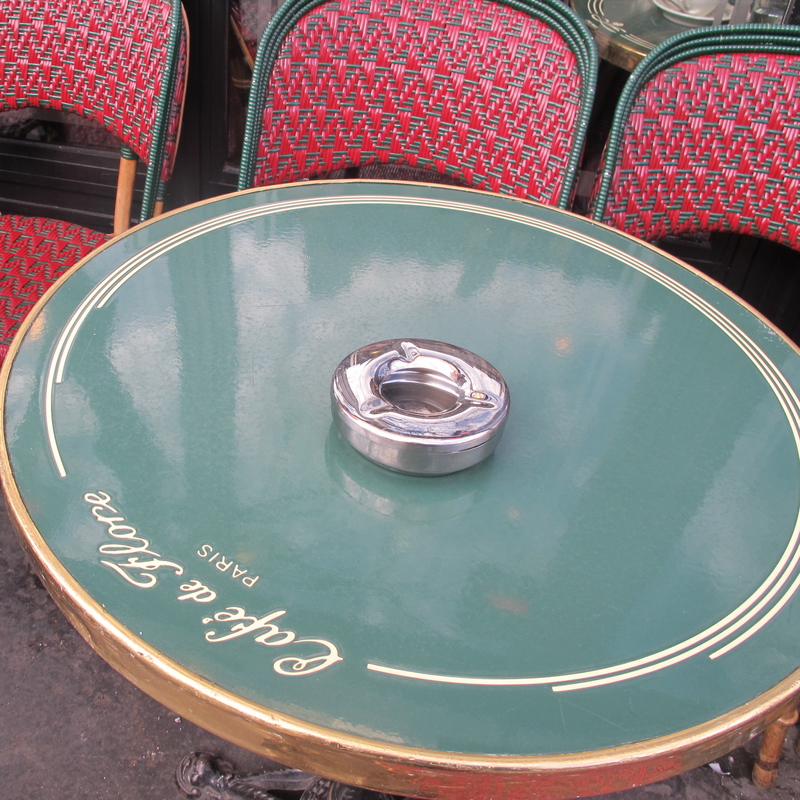 Next time I am in town, I will go in for a noisette and watch the world go by. Thank you for your comment. I hope you enjoy the Flore when you get there. I will definitely go there next time I’m in Paris. It sounds just marvelous! Thank you for your comment. The cafe is appealing and it’s so busy that it feels sometimes if the whole world is passing through. I do have a certain sympathy for the aloof waiters (and they are polite) because when service is at full tilt they never stop – not even for a nano second. Lovely post, B.! I have to go through your entire Paris section to be sure to cover all your spots next time I’m in Paris. Thank you so much Francesca, I am lucky that I can get to Paris so easily but I still wish I got there more often. Is that bacon? In the Caesar salad? Hmmm….. Still, I would eat there, just to soak up the atmosphere and pretend I’m being whispered to by some literary ghosts. Yet it is! I agree with you about the atmosphere, it’s what I like most about the place. Thank you so much for the compliment on the photographs. Oh well- looks like it’s back to French Rarebit next time 🙂 I passed nearby but not close enough to pop in, but I would have liked to.